From today, December 15 until December 24, Warp Records is offering a free download via its MP3 site, Bleep.com. Titled Bleep Loves…Labels, the 11 track collection features contributions from new signee Hudson Mohawke, 4 Hero side project Visioneers, rising downtempo producers Lone and 2 Tall, electro-disco-whatever producers Boyz Noize and others. It highlights the many underground labels which Bleep carries in addition to Warp; and the fact that all of Bleep’s MP3s come without DRM restrictions (unlike iTunes and Amazon.com). “Bleep Loves… Labels” is an exclusive FREE compilation hand picked by the Bleep staff to showcase a variety of sounds from this medley of forward-thinking labels. 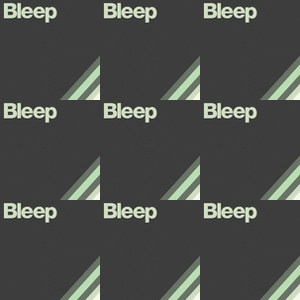 Moving from the some of the hottest electronic beatscapers around right up to Eastern European electric blues funk and folk-prog-rock workouts; this compilation gives an insight into the depths of Bleep’s catalogue. Update: Bleep Loves Labels has been rescheduled for February. No word on whether it will have a new or different track listing. Check the comments section for more information. This entry was posted in News and tagged Bleep.com, Warp. Bookmark the permalink. Yo where can i find the album then? Call me a retard but i cant find it on the bleep site…. You’re right…it’s not up there. Hopefully it will be posted soon. oh kay cool Ill keep checking it! Secondly – unfortunately, this free compilation has been delayed until February. However, rest assured that Bleep have this and a lot of cool stuff coming up in the 2009.